My family and I have been going to North Myrtle Beach for the past 28 years. We have our traditions and favorite restaurants, and a pretty set itinerary when it comes to dining. This year however, we had an extra night and discussed the hundreds of options along Highway 17 from North Myrtle into South. We landed on a restaurant we had driven by year after year, and after 2 visits in one week, we have found a new annual tradition. Thoroughbreds has been a staple on Kings Highway since 1988, and is a favorite among locals. The restaurant is huge - several dining rooms, a separate bar and lounge area, not to mention a reception room and additional space upstairs. 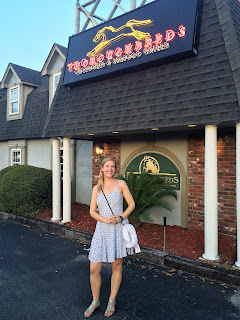 We enjoyed the ambiance, dimly lit and characteristic of a classic steakhouse. Upon one visit, we practically had a dining room to ourselves. On the return visit, just 2 days later, we were lucky to get a table. Servers are gracious and professional, with appropriate and timely check-backs. General Manager Dave Amend stopped by our table and could not have been more friendly and welcoming. My dad felt so comfortable, he even suggested they add his favorite cocktail (The 007 - Belvedere Vodka with Muddled Olives) to their martini list! A warm basket of crusty French loaf bread is served with dollops of addictive herbed butter. Appetizers, creatively named "The Starting Gate" range from Escargot to Lamb Chops. We chose the Sea Scallop Ramekin, combining tender, plump jumbo sea scallops with bell peppers in what seemed like a savory bread pudding. Scallops are nestled among custard and bread, making for a really decadent starter. Another appetizer, Blackened Beef Tips are a definite crowd-pleaser. Tender chunks of beef are seared and served on a bed of lettuce with tangy bearnaise sauce. The portion is generous but every bite will be inhaled. All entrees come with a House Salad, but you can upgrade to a Caesar Salad, prepared tableside, or my personal favorite, the Wedge. Iceberg Lettuce is sprinkled with bacon, crispy onions, blue cheese crumbles and the standout - roasted tomatoes. The housemade Blue Cheese Dressing is great, as is the house specialty Sweet and Sour Poppy Seed. The clever menu headings continue with "The Belmont Steaks." Thoroughbred's Filet Mignon is incredible. Your knife and fork slide right through it, and it's simply yet perfectly seasoned. Mashed Potatoes are a classic side, and Thoroughbreds' are heaven. Rich, buttery, and with the slightest tang (buttermilk or greek yogurt?) - you will easily clean your plate. Onto the "Seabiscuit" portion of the menu. 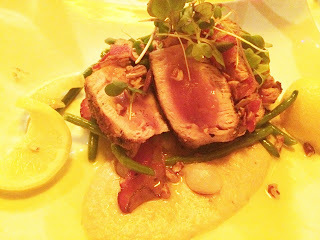 The Waimea Bay Ahi Tuna is one of the best renditions of tuna I've ever had. Ginger-seared Ahi Tuna is served a beautiful medium rare, atop Wasabi Yellow Corn Grits, with Haricot Verts, toasted Pecans, Pearl Onions and a sprinkling of Bacon rounding out the dish. I loved the addition of the pecans for crunch, and the pearl onions were a nice acidity. I would have liked a little more wasabi flavor in the otherwise outstanding grits, but I have an exceptionally high tolerance for heat, so other patrons may notice the bite. I will remember this dish for a very long time. 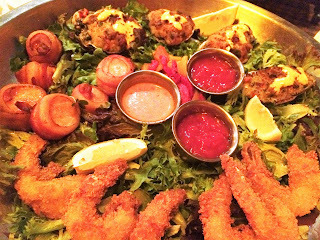 If you're torn between several options, the Shellhouse Trio is a great way to sample a bunch of different items. Bacon-wrapped Scallops are as delightful as you would imagine; Fried Gulf Shrimp are large, and have a nice crispy crust, unlike the soggy-battered shrimp I've encountered at your average seafood shack; and Oysters Thoroughbred are served on the half shell, topped with spinach, bell pepper, onion, bacon, panko and bearnaise sauce. I am slowly learning to enjoy oysters, and I much prefer to eat them this way than raw. Note the incredible presentation - this is served on a bed of lettuce on a huge silver platter! Prosiutto-wrapped Monkfish was a special that evening, served atop a creamy risotto. The fish is meaty and substantial, like a white steak. The saltiness from the prosciutto adds to the dish, cutting through the richness of the risotto. This should become a menu staple. 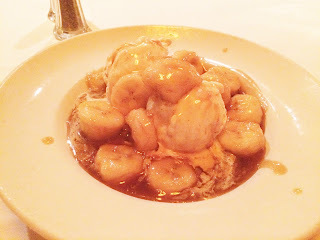 Being that I have an insatiable sweet tooth, I was shocked to discover that I had never experienced the joy that is Bananas Foster. Prepared tableside, this is one of the most luxurious and delicious desserts I've ever had. It easily makes my top 5 of all time. Bananas are sliced into coin shapes, and tossed among brown sugar, butter and rum. This sauce melts vanilla ice cream, until it practically becomes one consistency, and you will find yourself licking the bowl. It's utterly fantastic. Next time you find yourself in Myrtle Beach, visit Thoroughbred's. They are doing so many things right. You will enjoy every minute of it.